Visits to look at cattle. A P.O. Box stuffed with catalogs. Late nights spent in the recliner, analyzing EPD's, and marking up catalogs. Cow numbers analyzed. A list of bulls needed made. And then, the sales arrive. Buzzing with people, bulls being sorted and sold, the auctioneers humming along. And the meals....oh the meals! Don't laugh - sales are like weddings. One with a good meal is well remembered. Visiting friends only seen once a year. Usually on the same weekend, at the same location. The 2010 Sale season has officially arrived. It's our last season selling Red Angus bulls as a cooperator in the Lorenzen Red Angus Bull Sale. We went to check on our bulls this weekend at the feedlot with my sister and her friend Kirby. We're pleased with how they're doing. Clint had already been there once this year, but it was my first time. He was going to go Saturday, but waited until Sunday so I could go too. I didn't find him in the first pen....but I did find him. The bull I call "Teddy". My favorite bull of the 2009 calves. I've thought this bull looked like a teddy bear since he was born. He's grown now, but he's still pretty moderate and I still think he looks like a teddy bear! He's gentle too. Actually, all of our bulls were still gentle and came up to us in the pens. 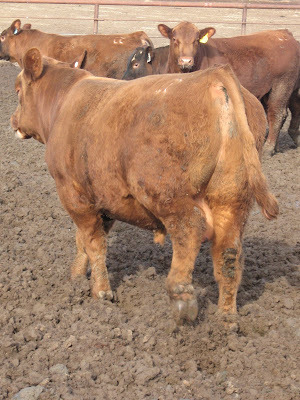 However, the bull in the picture below was Clint's favorite bull going into the feedlot, and still is. And to be quite honest, he probably is the best bull. But Teddy's still my favorite. Clint's favorite is so thick and long. And I apologize for this picture. It's the only one I could get of him profiled. 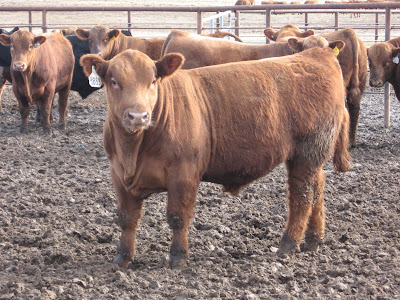 The Lorenzen Sale isn't until February 25th, so we'll probably be back to the feedlot later this month. By then the bulls will be scanned and sorted, and we'll have a catalog to sort through. A special note of thanks to Ian. Each year we tag our bulls with a colored tag in the right ear, and we chose a color we hope no one else will use. 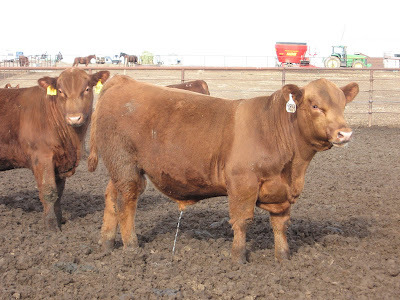 Because sorting 5-10 bulls out of 300 can be a bit hard. So we try to help ourselves. This year, we delivered our bulls and Ian and Lindsay's bulls together to Lorenzen's. But before we went to the feedlot, we tagged and tattoed all of the bulls at the Murdock's. We'd forgotten our own tags, but Ian helpfully had an extra supply. A supply of large, white, octaganol tags that we put in the right ear. Would you guess that our bulls were the only bulls tagged in the right ear this year! A small victory, but it was awesome! All we had to do was scan the pens....you'd see a sea of bulls with tags in their LEFT ears...and then one of ours! And while we've always tagged in the right ear, we'd never used octagonal tags. So thanks Ian - we were able to find all of our bulls and yours with ease! So smiling for you and your LOVE of Red Angus! I Love your Teddy Bear too....don't you just sometimes fall in love with certain ones?!?!? If only we could keep them forever! Praying it is a GREAT Sales season! Sweet blessings! P.S. I LOVE Your new header...it's amazing!